Learn the New iOS 11 APIs! iOS 11 introduces lots of great APIs and other changes, from the brand new Drag and Drop, to augmenting your world with ARKit, to expanding your app's horizons with machine learning in CoreML. Reading and understanding all the official Apple documentation on these changes can be time-consuming — and confusing. This is where iOS 11 by Tutorials comes to the rescue! In this book, you’ll learn the new iOS 11 APIs the quick and easy way: by following fun and easy-to-read tutorials. 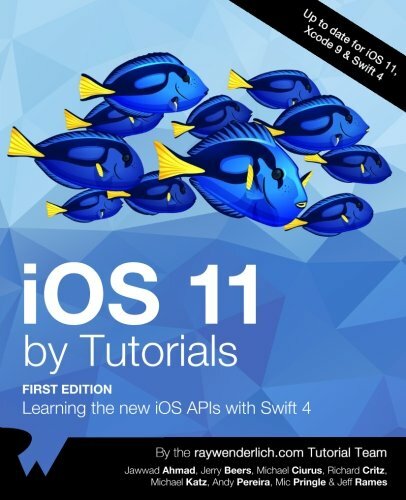 This book is for intermediate iOS developers who already know the basics of iOS and Swift development but want to learn the new APIs introduced in iOS 11. ARKit: Learn how to use ARKit to place 3D objects in your users' environment. CoreML: Explore using CoreML to analyze text: identifying its language, detecting sentiments, and much more. Then, turn to the Vision framework and learn how to do face detection and object classification. Drag and Drop: Learn how to use the new Drag and Drop API, moving items around within a single app and sharing them with other apps. Swift 4: Discover the enhancements in Swift 4, and its support in Foundation, such as the new Codable protocol, improvements to Dictionaries, and one-sided ranges. Layout and UIKit: Learn all about the new UI paradigms, including large titles, integrated search bars, and layout safe areas. PDFKit: Create PDFs using native Apple support, complete with thumbnails, markup, and forms. MusicKit: Give your users their music right in your app using the new MusicKit framework. And much more, including password autofill, dynamic type, and document based apps. One thing you can count on: after reading this book, you’ll be prepared to take advantage of all the improvements iOS 11 has to offer!